Fitting in 10 minutes of activity can lead you on a creative path. Be creative in ways that you can sneak it in. The nicer weather is approaching. 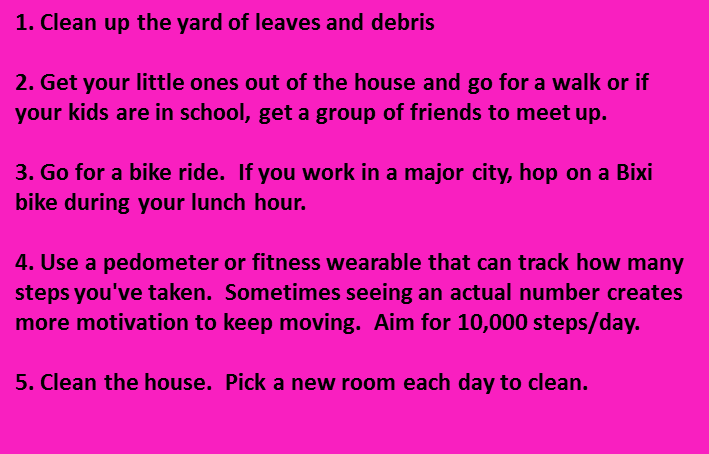 Here are 5 things you can do today. 2. Get your little ones out of the house and go for a walk or if your kids are in school, get a group of friends to meet up. 3. Go for a bike ride. If you work in a major city, hop on a Bixi bike during your lunch hour. 4. Use a pedometer or fitness wearable that can track how many steps you’ve taken. Sometimes seeing an actual number creates more motivation to keep moving. Aim for 10,000 steps/day. 5. Clean the house. Pick a new room each day to clean.